The UMD seal and name is featured with vibrant color and added depth on textured ivory and maroon museum-quality matting. Our industry-exclusive, state-of-the-art dimensional color makes the school's marks pop! It is framed in Westwood, our contemporary moulding featuring a walnut brown finish with gray undertones and warm, gold accents. Made in the USA! Shipping for the diploma frame is $20.99. Framed in Noir moulding with a black satin finish and two-toned inner lip. Features a gold engraved medallion of the UMD seal set into a 23K bezel within black and maroon museum-quality matting. School name is gold embossed below. Approximate overall frame size: 16.8"h x 19.3"w. Includes our easy-to-use level-lock frame hanging system! Made in the USA! Features a custom-minted brass medallion of the UMD seal. The medallion is placed in a special bevel cut opening within maroon and gold museum-quality matting and the school name is gold embossed below. It is framed in Sutton moulding with a rich mahogany finish with a black rippled edge inner lip. Made in the USA! Features name and official gold seal for UMD embossed on black and maroon museum-quality matting. It is framed in Murano moulding crafted of solid hardwood with a high-gloss cherry transverse grain and a gold lip. Made in the USA! Features a custom-designed medallion for the UMD emblem. This medallion is placed in a distinctive bevel cut opening within double black and maroon museum quality matting with the school name gold embossed below. It is framed in midnight moulding crafted of solid hardwood with a black matte finish. Made in the USA! Our Presidential Edition features a Masterpiece medallion of the UMD seal set into an archival-quality maroon suede mat. This edition enhanced with a gold wood fillet and framed in Madison moulding with a handsome flat panel profile in a dark walnut finish. Made in the USA! Features the name and the official gold seal for UMD embossed on black and gold museum-quality matting. It is framed in Redding moulding featuring a mahogany transverse grain furniture finish with a subtle shine and inner gold lip. Made in the USA! Display the UMD tassel alongside your diploma within black and maroon museum-quality matting and the school name and official seal is embossed in gold. It is framed in Southport moulding crafted of solid hardwood with a high-gloss cherry lacquer finish and black accents. Made in the USA! Features a custom-designed UMD medallion. This medallion is placed in a distinctive bevel cut opening within double black and maroon museum quality matting with the school name gold embossed below. It is framed in Midnight moulding crafted of solid hardwood with a black matte finish. Made in the USA! 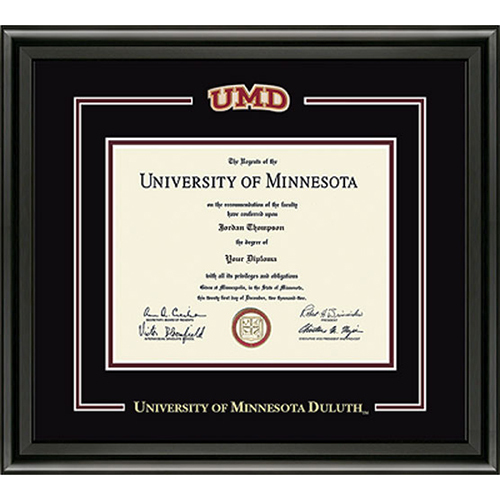 Features name and official gold seal for UMD embossed on black museum-quality matting. It is framed in Studio Gold moulding crafted of solid hardwood with deep mahogany furniture finish and gold inner lip. Made in the USA!